We offer you to visit snake farm with terrarium on its territory and interesting snake show. If this tour is booked beforehand, we offer you round transfer for free from your hotel/villa to the farm. Snake farm on Koh Samui was founded in 1920. From 10 AM till 6 PM you can see the cobra and other snakes show, Scorpion Queen and Centipede King, visit reptile zoo and take part in thrilling games with inhabitants of the farm. You can also buy unique drugs made of snakes organs and poison, and spirits with snakes, scorpions, centipedes inside the bottles. There are 163 species of snakes in Thailand, 85 species are venomous. You can see some of them and listen to an interesting story about the way of life. After the show, you can buy unique drugs made from snakes and their poison. Entrance ticket – 300 Baht. If you book beforehand, we can organize round transfer out of charge. My wife and I came early and were the only people there receiving a private show from Mr Cobra. 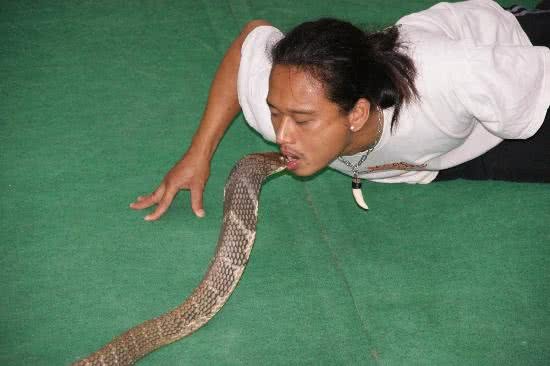 I had previously seen a Cobra show in India and thought it was something that my wife should see as well. I wasn't really expecting that much, but was really surprised how he handled the scorpions and the cobras.